The flame fern trail ride combines the Majestic Flame Azalea and the lush Fern Forest for a really enjoyable trail ride for everyone. You start up the mountain traveling through a hard wood forest filled with wild Flame Azaleas. After the hardwoods, you enter an enchanting white pine forest just like in the Star Wars movie. 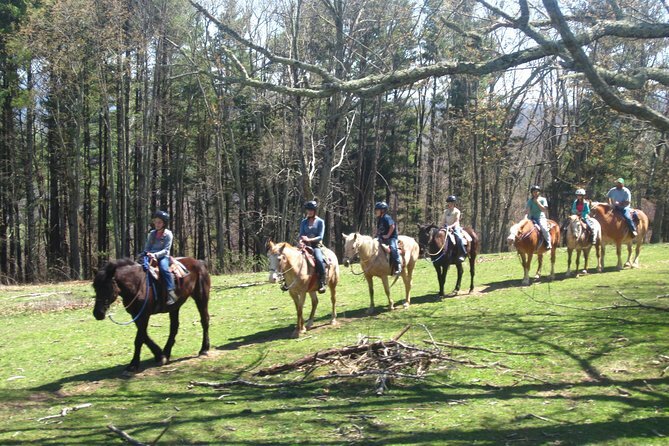 This beautiful horseback ride combines the Majestic Flame Azalea and the lush Fern Forest for a really enjoyable trail ride for everyone. You start up the mountain traveling through a hard wood forest filled with wild Flame Azaleas. After the hardwoods, you enter an enchanting white pine forest just like in the Star Wars movie! From the pines you emerge in a beautiful open meadow at 4200ft of elevation with majestic 30 mile views out to the Blue Ridge Parkway. You will think you are in the legendary movie "Sound of Music." This is an amazing experience. Descending the top you travel through an old youth camp. Next, you enter an enchanting lush, deep wood, fern forest. It meanders through a dense forest before returning to the barn. This is a 200 acre working horse farm. Plan at least 2.5-hours for your adventure as Trail Time is approximately 80-Minutes plus your Safety Program. • Horses don't know they are big. That's why we can control them with the bit in their mouth. • Horses think like little children and expect you to protect them. • You NEED to know this. Whoever is most stubborn wins. You need to be more stubborn than the horse. You return to the Stables where your vehicle is parked or for pickup by your family. Plan an extra 50-60 minutes, in addition to your trail time, for your safety and training program. Please Note, This Starts at your stated trail time, not before it. Your Trail immediately follows your safety program. Your Safety Program consists of a video or live demonstration covering the horse's training, safety and horse personality. You are given a chance to try your horse in the ring before departing. If needed, your horse can be changed before your trail.